Fletcher must be adaptable and resilient in the face of a changing external environment. At the same time, it is important that we strike a balance between the aspects of Fletcher that must adapt and evolve and the aspects that make it truly distinctive. Finding the balance and making the right measure of adaptation and gauging the “market” impact will take time, learning and re-calibration—there is no precise model for translating our actions into the desired outcomes. Thus, this strategy should be treated as a living document, subject to course corrections along the way. Annual reviews of progress against each of the four major strategic objectives, a mid-term assessment of the strategy in Year 3, and a major review in Year 5 will be conducted to assess how effective the current plan has been in meeting the objectives. If it is found that the plan has not successfully met many or most of its objectives, we may need to explore more far-reaching options. This is an ambitious but manageable plan with many actionable elements. Not all good things can be done at once; some sequencing is inevitable, especially for elements that will require additional resources or clear points of focus. We will need to seize on opportunities for efficiencies and savings—in terms of both time and money—by scaling back some of our ongoing activities, including by rationalizing courses, centers and partnerships. 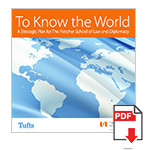 Through the successful implementation of this plan, The Fletcher School will better-prepare its students for positions of leadership and impact, enable its faculty to leave a bigger mark on the world through research and service, build a robust revenue stream to support its mission, bolster its reputation, diversify its partnerships and attract the world’s top students—the next generation of global leaders.